Continuous health monitoring has become a major theme of our aging society. Portable devices play an important role here. Many optical portable devices are susceptible to motion induced artifacts. We have performed an experimental study for detection of fluid pulsation based on multi-exposure speckle images, in presence of motion induced artifacts. Induced motion of a wide range of frequencies and amplitudes were generated to resemble sensor motion with respect to skin. The data was analyzed using speckle contrast and correlation. We concluded that both techniques have their own advantages, depending on the measurement configuration. A study of angles between illumination and detection revealed that larger angles yields better signal. Shorter exposure time was more successful in extracting the signal. We also performed in-vivo measurements that agree with the in-vitro case. We also show that a minimum collection of two pixels from the speckle image is sufficient to extract relevant results. 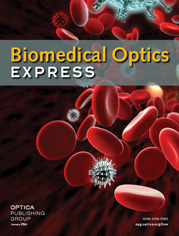 D. A. Boas and A. K. Dunn, “Laser speckle contrast imaging in biomedical optics,” J. Biomed. Opt. 15, 011109 (2010). A. K. Dunn, “Laser speckle contrast imaging of cerebral blood flow,” Ann. Biomed. Eng. 40, 367–377 (2012). M. Nemati, L. Wei, M. G. Zeitouny, M. Stijnen, S. van Tuijl, N. Bhattacharya, and H. P. Urbach, “Laser speckle analysis of flow in presence of static scatterers,” Proc. SPIE 8413, 84131D (2012). D. Briers, D. D. Duncan, E. Hirst, S. J. Kirkpatrick, M. Larsson, W. Steenbergen, T. Stromberg, and O. B. Thompson, “Laser speckle contrast imaging: theoretical and practical limitations,” J. Biomed. Opt. 18, 66018 (2013). M. Nemati, R. W. C. G. R. Wijshoff, J. M. a. Stijnen, S. van Tuijl, J. W. M. Bergmans, N. Bhattacharya, and H. P. Urbach, “Laser-speckle-based detection of fluid pulsation in the presence of motion artifacts: in vitro and in vivo study,” Opt. Lett. 38, 5334–5337 (2013). M. Vegfors, L.-G. Lindberg, P. Å. Öberg, and C. Lennmarken, “Accuracy of pulse oximetry at various haematocrits and during haemolysis in anin vitro model,” Med. Biol. Eng. Comput. 31, 135–141 (1993). A. G. Gilman, “G proteins: transducers of receptor-generated signals,” Annu. Rev. Biochem. 56, 615–649 (1987). M. Michalski, V. Briard, and F. Michel, “Optical parameters of milk fat globules for laser light scattering measurements,” Lait 81, 787–796 (2001). R. F. Bonner, R. Nossal, S. Havlin, and G. H. Weiss, “Model for photon migration in turbid biological media,” J. Opt. Soc. Am. A 4, 423–432 (1987). P. Shi, V. A. Peris, A. Echiadis, J. Zheng, Z. Yisheng, P. Y. S. Cheang, and S. Hu, “Non-contact reflection photo-plethysmography towards effective human physiological monitoring,” J. Med. Biol. Eng. 30, 161–167 (2009). J. D. Briers and S. Webster, “Quasi real-time digital version of single-exposure speckle photography for full-field monitoring of velocity or flow fields,” Opt. Commun. 116, 36–42 (1995). M. Draijer, E. Hondebrink, T. van Leeuwen, and W. Steenbergen, “Review of laser speckle contrast techniques for visualizing tissue perfusion,” Lasers. Med. Sci. 24, 639–651 (2009). A.F. Fercher and J.D. Briers, “Flow visualization by means of single exposure speckle photography,” Opt. Commun. 37, 326–330 (1981). R. Bandyopadhyay, A. S. Gittings, S. S. Suh, P. K. Dixon, and D. J. Durian, “Speckle-visibility spectroscopy: A tool to study time-varying dynamics,” Rev. Sci. Instrum. 76, 093110 (2005). K. Schatzel, “Noise on photon correlation data. I. Autocorrelation functions,” Quantum Opt. 2, 287–305 (1990). B. J. Berne and R. Pecora, Dynamic Light Scattering : With Applications to Chemistry, Biology, and Physics (Dover Publications, 2000), unabridged ed. P. A. Bandettini, A. Jesmanowicz, E. C. Wong, and J. S. Hyde, “Processing strategies for time-course data sets in functional MRI of the human brain,” Magn. Reson. Med. Sci. 30, 161–173 (1993). Wijshoff, R. W. C. G. R.
Fig. 1 Flow phantom: a) Components of the flow sample: the base flow cell with the inlet and outlet, the rigid insert that is placed in the base flow cell defining the channel depth, the flow cell membrane which can be either transparent or Delrin and the stainless steel ring which is used in bottom and top to fix the flow cell. b) The insert with the flow channel. c) An assembled version of the flow cell. Fig. 2 a) Schematic of the experimental setup and b) The experimental setup. The motion artifacts are generated by the motion of the laser beam which creates a different penetration depth and distance to the detector. The speckle contrast has been calculated over the entire illuminated area. Fig. 3 Speckle contrast variation in time and spectral domain is shown for a milk pulsation of 1Hz for a rigid (upper plot) and flexible channel (lower plot). Fig. 4 The effect of medium is shown for milk pulsation of 1Hz using glass (upper plot) and Delrin (lower plot) based on a) speckle contrast and b) correlation analysis. Fig. 5 Spectral analysis is shown for two displacements of the illuminating laser with an angle of 70° with the camera: 0.5mm (blue line) and 3mm (red line) displacement amplitudes and at the frequencies of 0.7Hz and 4.5Hz measured with exposure times of a) 20ms, b) 16ms c) 8ms and d) 4ms. The plot shows the result of measurements using the correlation analysis (right panel) and speckle contrast (left panel) for milk pulsation at 1.25Hz. The y-axis shows the amplitudes of the correlation analysis and speckle contrast on the right and left side of each panel, respectively. Fig. 6 Spectral analysis is shown for two displacements of the illuminating laser with an angle of 20° with camera: 0.5mm (blue line) and 3mm (red line) at the frequencies of 0.7Hz and 4.5Hz measured with exposure times of a) 20ms, b) 16ms c) 8m and c) 4ms. The plot shows the result of measurements using the correlation analysis (right panel) and speckle contrast (left panel) for milk pulsation at 1.25Hz. The y-axis shows the amplitudes of the correlation analysis and speckle contrast on the right and left side of each panel, respectively. Fig. 7 Spectral analysis for pixel correlation is shown for frequencies of 0.7Hz and 4.5Hz with displacement amplitudes of 0.5mm and 3mm after being analyzed in a) perpendicular and b) parallel directions to the induced motion artifact. In each plot, the arrow points at the fluid pulse rate. The y-axis shows the amplitudes of the parallel configuration and perpendicular configuration on the right and left side of each panel, respectively. Fig. 8 Spectral analysis is shown for the measurement with human finger for two displacements of the illuminating laser: 0.5mm (blue line) and 0.8mm (red line) measured with correlation analysis (right panel) and speckle contrast (left panel). The y-axis shows the amplitudes of the correlation analysis and speckle contrast on the right and left side of each panel, respectively. (1) K = σ < I > . (2) g 1 ( τ ) = 1 T ∫ − ∞ + ∞ E * ( t ) E ( t + τ ) d τ . (3) K 2 ( T ) = 2 T ∫ 0 T β | g 1 ( τ ) | 2 ( 1 − τ T ) d τ .